of the day in motion and sound. As Sarah -our beautiful bride- tearfully repeated her vows at the altar, I instinctively reached for a video camera- but Sarah chose not to hire a videographer. I felt sad that that memory of that remarkably powerful scene - perhaps the single most important event in her life - will forever be lost. 2. In-camera editing rocks! (am I young enough to say that?) As a photo rookie, I LOVED the ability to instantly delete my last (usually) lousy photo at the push of a button...and Sam would never see it:) I spend an average of 30 hours editing each wedding video- how cool it is for my photog friends to be able to do much of the image editing on-site! 3. Changing exposure accurately in rapidly changing lighting conditions is much easier in video. Since you are looking at the constant LCD readout on a video camera, dialing in the proper exposure real-time is a snap. I fequently found myself chimping (looking at the Nikon's LCD) after each still shot. However, I was more relaxed not having to be constantly worried about making sure the camera was properly framed, focused and exposed or correct audio was being captured as I had become accustomed to in shooting video. 4. 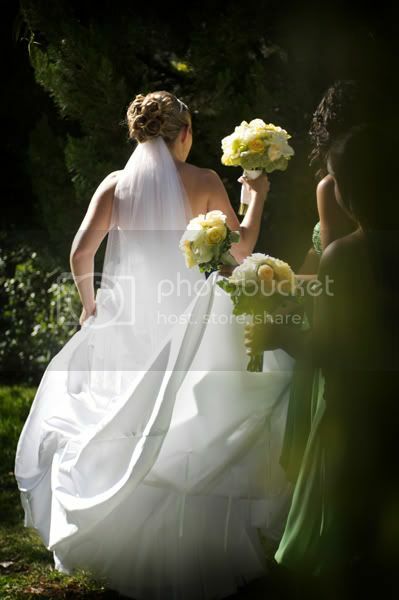 Professional Wedding Videography & Photography are complimentary artforms. Brides sometimes ask me if they need a Photographer if they can make stills from video. Not only do stills from a professional photographer render much higher resolution than video stills, but a good photog typically has advanced lighting and compositional skills vital for posed shots such as formals or an engagement session . Thanks Sam! categories / "Newcastle Wedding Gardens", "Sharpe Photographers"